Weber, David, and Eric Flint. 1633 . Baen 2002. Summary: Cosmic "garbage" striking Earth causes entire pieces of geography (i.e., towns) to be transported back in time, including a West Virginia coal town shifted from modern times into 17th century Germany. Series note: Apparently a never-ending series of related novels and shared-world anthologies. The published novels are Flint's 1632 , Weber and Flint's 1633 , Flint and Dennis's 1634: The Galileo Affair , Flint and DeMarce's 1634: The Ram Rebellion , Weber and Flint's 1634: The Baltic War , Flint and DeMarce's 1634: The Bavarian Crisis , Flint and Dennis's 1635: Cannon Law , and Flint and DeMarce's 1635: The Dreeson Incident . The published anthologies include Ring of Fire , Ring of Fire II , The Grantville Gazette , Grantville Gazette II , Grantville Gazette III , Grantville Gazette IV , and Grantville Gazette V .
Comments: When this series first started, a related novel called 1781 and involving George Washington transported to ancient Rome was reportedly planned. It has since been cancelled. Publication note: The series is also known as the 1632verse or the Ring of Fire series. What if: Modern technology was introduced in the middle of the Thirty Years War. Summary: An entire West Virginia coal town is mysteriously transferred back 370 years in time and ends up near Breitenfeld, Thuringia, in the middle of the Thirty Years War. 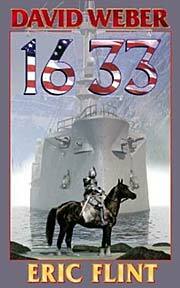 Series note: An Assiti Shard novel with direct sequel 1633 . Published: Baen 2000 (0671578499BUY), 2001 (0671319728BUY), 2009 (1439512957BUY). Summary: The "up-timers" having made common cause with Gustavus Adolphus of Sweden, Richelieu's machinations to restore the European balance of power to France's favor drastically alter the continent's network of alliances, and the war is carried into the Netherlands and the German-Danish frontier. Series note: An Assiti Shard novel and direct sequel to 1632 . Published: Baen 2002 (0743435427BUY), 2003 (0743471555BUY). Series note: An Assiti Shard novel. Published: Baen 2004 (0743488156BUY), 2008 (1435293312BUY). Published: Baen 2006 (1416520600BUY), 2007 (1416573828BUY), 2008 (1435294823BUY). Published: Baen 2007 (141652102XBUY), 2008 (1416555889BUY). Published: Baen 2007 (1416542531BUY), 2009 (1439132763BUY). Published: Baen 2006 (1416509380BUY), 2009 (1439560676BUY). Series note: Shared-world anthology set in Flint's Assiti Shard 1632 timeline, including Deann Allen and Mike Turner's "American Part Time", Andrew Dennis's "Between the Armies, Jody Dorsett's "The Three R's", Eric Flint's "The Wallenstein Gambit", Dave Freer's "A Lineman for the Country", Loren Jones's "Power to the People", Mercedes Lackey's "To Dye For", David Weber's "In the Navy", and K.D. Wentworth's "Here Comes Santa Claus". Series note: Shared-world anthology set in Flint's Assiti Shard 1632 timeline. Published: Baen 2008 (1416573879BUY), 2009 (1416591443BUY). Comments: A collection of "fanfic" stories originally published as the online Grantsville Gazette on the Baen Books website. Published: Baen 2006 (1416509410BUY), 2008 (141655565XBUY).